I don't have to tell you, do I? You can tell from the dejected postures. I'm not usually particularly superstitious but I had a premonition that if I wrote about the Honduran soccer team that I would jinx their winning streak. Yup. I did. It's all my fault. Every time I brag about anything, punishment follows. Panamá beat Honduras last night. 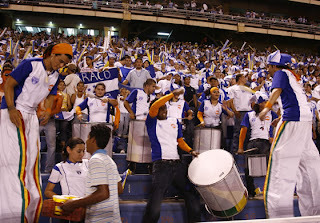 Honduras has one more game against El Salvador in the Copa de Naciones to determine who will get third place. Panamá and Costa Rica will vie for first place. So, no more sports reporting from me until the tournaments are over! The excitement of those announcers is really hilarious. And winning makes me happy for Honduras because it is so important to the people. Unfortunately, for the past few years, they haven't usually done so well. I never had to ask El Jefe who won the game as I could tell from his dejected manner. I'm not sure what happened, but lately (a new coach? ), they have been hot, hot, hot. A few months ago, Honduras beat Canada, as God wished. Then their team turned around and the very next game beat Jamaica! One night, I heard guns shooting off (more than usual) and fire works. I remember thinking "Is it a holiday?" and then "How odd to have a child's birthday party on a Wednesday night." El Jefe soon let me know that Honduras beat that dastardly arch enemy Mexico! The only other victory that even comes close to the elation of beating Mexico is beating the US. Apparently, the Mexicans were taunting Honduras that they couldn't win because Honduran food was so bad that the Honduran players were malnourished among other nasty things. WELL! I guess we showed them! 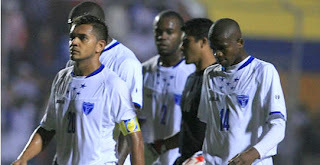 One by one, Chile, Nicaragua, and Belize have fallen like dominoes to the far superior Honduran national team. A few days ago, El Salvador was trounced. Will this never end? 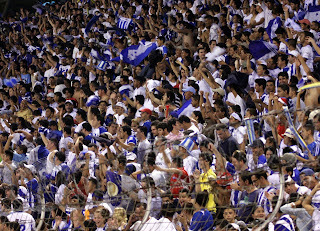 Will Honduras make it to the world cup some day? Honduras has a huge disadvantage to overcome. What does it take to be a world champion? Good players, sure. A good coach, of course. But more than anything, it takes money! Just like in the Olympics, the best athletes are usually bought by other, more wealthy countries. It's not fair! The custom is that after a winning game, everyone takes to the streets, honking, screaming, cheering, fist-shaking, Titanic arm-raising 'I'm king of the world!' postures, with people hanging out of car windows and piled into the back of pickup trucks. It's bumper-to-bumper traffic on all of the major streets. The price of gas be damned! Others who watched the game at home go outside and shoot off their guns or set off fireworks. All is right in the world. Tonight (January 30), we play Panamá again. Wish us luck! It has been almost a year since I mentioned my yogurt making. Making homemade yogurt has become such a regular part of my life that I don't think of it as blogging material. Yawn. 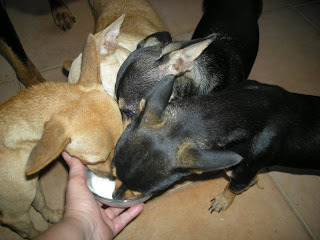 What is blog-worthy about yogurt, at least in my humble opinion, is that I'm not the only one in this household who loves yogurt! 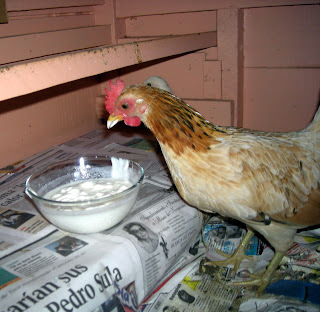 Yogurt is a huge treat for the dogs and chickens, too. They love it plain, unsweetened and unflavored. I've stretched out my powdered yogurt culture supply, using only half a packet when I start a new batch, and still have some from the original purchase. Good thing since it isn't available here in Honduras, at least not in La Ceiba. After each fresh batch, I save about 1/3 cup of yogurt to activate the next batch. That works for a few batches until the yogurt starts to get grainy and then I start a new fresh batch. I'm not sure what causes the graininess, maybe the dried milk powder, which helps to make the yogurt thicker. It doesn't affect the flavor but I don't like that texture. 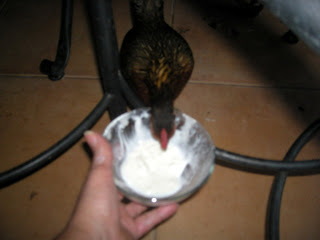 Yogurt flavored with papaya and honey is still my favorite. A ton of information from yogurt experts is available on the internet. 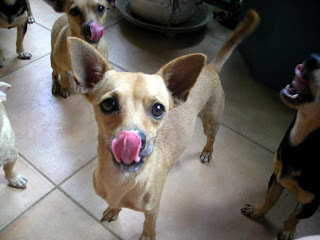 I gave some good links in the original article: La Gringa's gonna live to be 110. 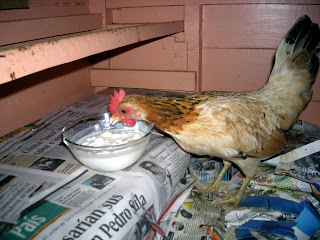 If you like yogurt or just want to do something good for yourself, give homemade yogurt making a try. It's so simple and so forgiving. I can let it incubate 4 or 5 hours and it is fine or I can let it go 7 or 8 hours and it is fine, too. Once I even forgot about it and let it go all night long − still fine! 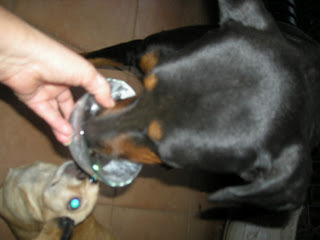 Note the yogurt "mustaches" on the chicken's beak and above the dogs noses as well as all the lip-licking going on. Some of these photos are blurry as it is hard to take a photo with one hand and feed dogs with another while the other dogs are jumping on me with excitement, but you get the idea. 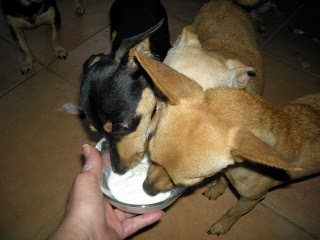 I missed the most terrific shot one day when the yogurt bowl was being shared by a chihuahua and a chicken at the same time! Can you imagine? That was one determined chicken. We've had a (relatively) cold and rainy couple of days here in La Ceiba, Honduras. Yesterday we had 3 inches of rain and today might be close to that. (See my rain counter under the weather gadget in the sidebar.) I won't report the temperatures because judging by the US and Canadian weather reports I've seen, most of you would just snort or guffaw at the thought of being cold in this temperature, but my tropical attire included sweat pants and socks for the past two days. I had planned to make fajitas for dinner and was lamenting the fact that I didn't have anything to make a nice hot pot of soup instead. El Jefe said he had a craving for potato soup so...Eureka! I had potatoes, carrots, onion, garlic. The fajitas can wait since Honduran beef needs a couple of days marinating with meat tenderizer anyway. El Jefe was going to watch the Honduran-Chile futbol (soccer) game upstairs at 6 p.m. so that seemed a good time for me to retire to the kitchen. I turned on the downstairs television to keep me company while I was peeling potatoes. Searching around all the usual channels, I was stopped dead by HBO. A lovely older black woman (Bettye LaVette, I later found out) was singing with Jon Bon Jovi − "Change is a-coming." Wow. That was so powerful. I actually started tearing up and felt shivers. This was an HBO inauguration special called "We are one" that possibly everyone in the world knew about except me. I'm not sure how much of the show I missed but I watched/listened from that point on. I was really emotional going from the warm fuzzies to the shivers and tearing up several times. Beyonce's singing of America was the perfect ending. What a beautiful show! What great music! And best of all, no politics, just celebrating, instead of bashing, America. I am a patriot. Which brings me to my next point: People who have left their home countries and live in another are called expatriates, not ex-patriots! It has nothing to do with patriotism. And finally, the soup was fantabulous, seasoned to perfection, and Honduras won 2-0! A real warm and fuzzy evening. This video is available only in the US and its territories. We apologize to the rest of the world. Darn! This kind of thing makes me feel like a third-world citizen. 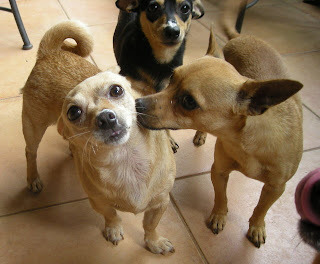 Dog translation: What the #*&$? The dogs started barking like crazy the other morning so I looked out to see who was in our side street. 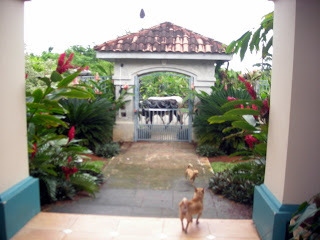 It's a dead end street with no other houses and the dogs consider that they should warn us of any possible intruders. Well, well, well. Shades of the wild west. It was the big, furry kind of intruders, a whole herd of them. 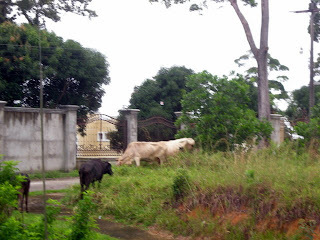 I haven't seen cows in the neighborhood in a long time, though you may remember the horse stampede from last year or the sheep traffic jam of the year before. Hey, I like to see the animals. 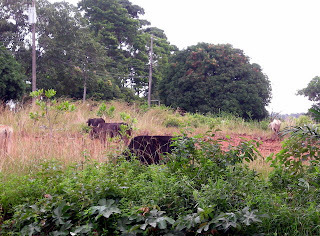 I wish the cows would stick around to 'mow' some of these overgrown vacant lots, though the cows seem very particular about what they eat and there usually isn't much improvement after they leave. I wouldn't mind scooping up some of the residue that they leave behind for my compost pile either, but that would probably be looked down upon by my neighbors. One of my neighbors started keeping chickens! 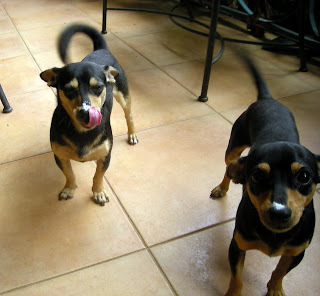 When they first visited us, they were bug-eyed to see chickens in our garden. These are people from a wealthy family and although they politely asked about the chickens, and I happily told them how much we enjoy them, I felt a little....I don't know....maybe looked down upon as a pauper who couldn't afford to buy her own eggs. Now they have their own. 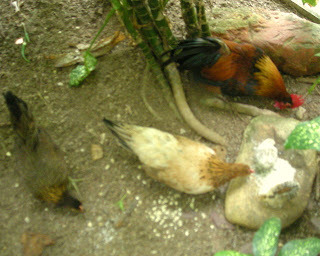 Bantams just exactly like ours. Will wonders never cease? Though I have an idea that it is probably one of the maids or security guards that is actually caring for the chickens. Perceptions are a lot different here in Honduras. 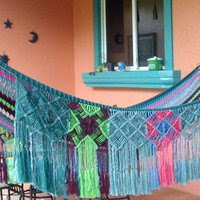 Do-it-yourself or sustainability type projects always got admiring congratulations from my neighbors in Texas. Here in La Ceiba, it is more likely to get quizzical looks as if they are wondering why I didn't just pay someone to do it for me. That has been my experience from people of all walks of life. This snobbishness or classism or whatever you want to call it isn't going to change me because I enjoy doing things myself, but I have to say that it doesn't feel good to be on the receiving end. In any case, I don't think that we will be adding cows or sheep to our menagerie. They do too much damage to the landscaping.